Need a little Violet in your Day? One of our nesting boxes bit the dust last year when it was chewed up by neighborhood squirrels, so my grandkids Violet and Charlie painted this one. The birds have already set up housekeeping and we expect to hear little chirps and tweets very soon. Spring is having a tough time making up its mind, but little signs of beauty to come are poking up all over the yard. Only a few crocus are open, but there are more to come! I only wish they would hang around for a little bit longer. Sempervivum is one of the first garden inhabitants to announce the arrival of Spring. I love how its color perks up as the soil warms. A little garden trellis lends a splash of vibrant red. Now I just need to decide what I will grow on it this year. Last, but far from least, a little gift from my favorite ‘flower’ and most frequent garden helper – my granddaughter Violet. She likes to fill jars with lots of little notes of love, encouragement, and blessings…oh, and a little bit of glitter to add an extra measure of sparkle to my day. Author barefootlilyladyPosted on April 2, 2019 Categories Gardening, Grandkids, Six on Saturday, UncategorizedTags crocus, daffodils, My Violet, nesting box, sempervivum2 Comments on Need a little Violet in your Day? If I have to pick a favorite, it would undoubtedly be Creating a Perennial Garden in the Midwest by Joan Severa. I read it nearly every winter gathering ideas, hopes and dreams for the garden sleeping beneath the snow in my own little corner of the world. Joan Severa passed away in 2015, but I was blessed to meet her in the days before I began caring for my mother. Back then, before momma’s Alzheimer’s diagnosis, I actually had time to attend an evening garden club meeting that met in my neighborhood. One sultry summer evening our garden club members got together for a little neighborhood walking tour of area gardens. Joan’s garden was one of them. I was so delighted to learn that she lived within walking distance of my own home and garden. It was a “two-fer” tour, as she and her next door neighbor and best friend Chris had seamlessly merged their adjoining gardens into one lovely gardenscape. It was so very inspiring. Back to my favorite gardening book. It’s my personal favorite because Joan shared things I need to know as I garden not only in this USDA Zone 4 Midwest area, but in this very neighborhood. Lovely photos of her own garden compelled me to keep turning pages, and her engaging writing style made me feel much like we were sitting on a porch overlooking her backyard paradise whilst we sipped tall glasses of ice tea. Joan’s engaging writing included suggestions for how to choose and create a garden site, plants that do well around here, how to care for said plants, step-by-step instructions for the best way to create and use mulch…and most importantly, for me, what plants to avoid. The book is filled with photographs too. Absolutely LOVE it! My second favorite? A Gardener’s Journal, a 5-year garden record book. I’m the author of this book as I make notes of how my own garden is doing in a given week, what I planted, what came up (and what didn’t), when certain bugs appeared (and how I tried to get rid of them). I also note ideas for next year and jot down the names of plants on my ‘wish-list’ (just in case someone wants to buy me a present). Here is a peek at one page in my journal. Favorite #3 – Further Along the Garden Path, by Ann Lovejoy. My friend Judy gave me this classic book out of her own garden library. As I page through this beautiful book and guide to the gardening year, the amazing photos taken by Mark Lovejoy actually remind me of Judy’s garden paths which meander through her mostly wooded landscape. A lovely surprise awaits around each and every turn in the path. When I moved from Milwaukee to Fitchburg in the summer of 1999, I left behind my own beautiful garden. Even though I had dug up divisions of various perennials to plant in my new garden, I didn’t get the diggings planted soon enough and lost many of my Milwaukee garden treasures during that brutally hot summer. Judy generously shared pieces of her Verona garden with me, helping me create new gardens in my new gardening space. I think of her with love and gratitude whenever I read this book or see a flower that she shared with me. I have spent hours browsing through this little book, filling my mind with landscape plans and ideas for my gardens. Beds & Borders contains 40 professional landscaping designs. You can use the sketches and plant lists as a do-it-yourself guide to creating your own oasis of floral loveliness, or you can order blueprints of your favorite designs to hand off to a professional landscape artist. In addition to too many hours of gardening daydreams within, novice and expert gardeners will find the book to be filled with oodles of gardening tips and design techniques. And one more pleasurable read. An Island Garden, by Celia Thaxter with pictures and illustrations by Childe Hassam. Beautiful. Enchanting. Educational. It’s the inspiring story of her Appledore island garden, written in vivid detail, every word a delight to the senses. If you love gardens as much as I do, you simply must find a copy of An Island Garden. Once you have the book in hand, clear your schedule, make yourself a cup of tea and find a cozy spot near a window – preferably one which overlooks one of your snow-covered gardens. As you read, I promise you will be transported to Celia’s island garden, hear the crash of the waves, smell the sweet aroma of carefully tended blossoms, gaze in wonder at the sight of magnificent old-fashioned hollyhocks swaying in the warm ocean breeze, and hear the sweet song of nesting birds. Whenever I read this book, I feel as though I’m kneeling in the dirt right next to Celia helping her tend her beautiful garden while she mentors me in tending my own little patch of this earth. Signing off to dream of daffodils and tulips. We awoke to a light blanket of snow yesterday morning – our first (just barely) measurable snow of the season. The powdery dusting left my garden bench in the shade garden looking pretty, but not quite so inviting. Likewise, the arch to the backyard looks cold and forlorn as it awaits the return of Clematis ‘Princess Diana’ and her lovely deep pink flowers. The locust tree stands tall as a backdrop and you can see the seed pods I mentioned last week waiting for the next windy day to knock them out of the tree. Though said seed pods are a messy harbinger of fall, the dappled shade the tree provides in summer makes it worth the extra effort. The tree’s canopy allows just enough sunlight to filter through so that grass can grow and part-sun perennials can thrive. Momma’s blue pot precariously perched atop a few stacked bricks still needs to be emptied and readied for next spring’s new floral pretties. Marigolds or zinnias? Moss roses perhaps? Wait! Maybe I should plant it up with some of those bulbs I haven’t planted yet! I never quite get around to trimming off the spent hydrangea blossoms. The pretty snowy caps have me convinced that’s not such a bad thing. Our bird feeders each received cute little snowy rooftops. It may be gloomy and overcast today, but the feeders have been very busy with diners – especially blue jays, a wood pecker and cardinals – and the pesky squirrels. I was happy to discover a flowerpot within the shelter of the front porch still shows off a bit of fall’s snapdragon magic. There are still a few must-do items on my fall cleanup list, but most of what’s left will probably have to wait until spring. Although, our local weather lady tells me I might have a very small window of good weather toward the end of the week. Maybe, just maybe, I’ll get those last few tulip and daffodil bulbs in the ground. Meanwhile, I think I’ll make myself a cup of tea and poke around on our ‘Six on Saturday’ host’s site. It’s always such fun virtually touring a few gardens. Won’t you join me? I’m making progress as I traipse around in my muddy flowerbeds. But, as hard as I’ve tried, I just can’t seem to get those items crossed off my list. It has been such a wet fall! This is what gardening looked like this week. Gardening is a muddy mess. Cut back an overgrown daylily and uncovered this hidden little bright spot of stonecrop. Iris ‘Immortality’ just might unfurl a few more fragrant blossoms…and you just might be able to catch a glimpse of a few volunteer snapdragons still holding their own too. A wee bit of phlox still strutting its stuff. We have a locust tree with a nasty habit of dropping messy seed pods for several weeks out of the year. We pay our grandsons to pick up ‘tree poop’ (named for its shape…and because little boys relish gross names). We give the boys 5-gallon pails and pay a goodly sum for each filled pail. As I type, the tree continues to drop seed pods on the ground, thus ensuring these boys a college education over time. The two youngest grandsons recently spent the night. The aforementioned job is so much more fun under the cover of darkness when glow sticks and flashlights are involved. I’m a little weary for wear today, having been up quite a bit last night taking care of my Momma. But I know that the fresh air does me good, so I spent a little more time cleaning out flowerbeds this morning. Making progress, but what a muddy mess. More rain is in the forecast…and cold too. I know what that means. The snow will soon fly and soon blanket the flowerbeds in the sleep of winter. What doesn’t get done now will wait until spring when we will start the whole beautiful process once again. There you have it – my Six on Saturday, a meme started by The Propogator, a UK gardener and friend I’ve never met. Since joining up with The Propogator and other “sixers” all over the world, I learn something new every week from the participating gardeners…and get to enjoy glimpses of their gardens too. This is the link to the rules if you’d like to join in. It’s hard to imagine there will be anything much to photograph in the coming weeks, but I’m up for the challenge. How about you? Do you have a favorite garden cleanup method or tool? I’d sure love it if you’d leave your favorite tip in the comments below. As I surveyed my gardens this morning, searching for beauty I could share, my eyes at first only saw the work that needed to be done…like pulling all of this frosted hosta. In focusing on the mess, I nearly missed this lime-green bit of beautifulness. And the little snapdragon faces smiling at me on the front porch. I might never have explored the lacy layers of fungus growing on our neighbor’s tree stump and woodpile. Fascinating. It makes me wonder how many other beautiful things I would see in life if I would just stop to look. And there you have it — my Six on Saturday. For more glimpses of gardens all around the world, head on over to the Six on Saturday host site at https://thepropagatorblog.wordpress.com/category/six-on-saturday/. As this mid-stage of Alzheimer’s drags on, Mom is sleeping quite a bit more, not only at night (which I appreciate), but during the day as well – sometimes skipping a meal in lieu of sleep. Unfortunately, her nighttime sleep doesn’t appear to be very restful, as she gets in and out of bed various times throughout the night – sometimes to use the restroom, other times to explore the contents of her purse or her dresser drawer, or watch the real or imaginary happenings going on inside our house or outside of her window. We have also noticed she has been less content during her awake hours and is more easily agitated. She paces back and forth between her bed and her chair at the kitchen table, never quite settled in either place; never quite sure if she’s going to bed or getting up. Long ago, when my mother was still able to make her own decisions, we had discussed her wishes related to end of life care. We had agreed that there would be “comfort measures only” as her time here on earth draws to a close – and she entrusted me with the future task of making those decisions. Momma is not yet in a state of decline which requires hospice intervention and end of life care, but she does qualify for palliative care in this transitional time of declining health and memory. At the end of August, a nurse practitioner came to our home to establish a course of home-based palliative care. I liked Diane right from the start. What’s not to like? 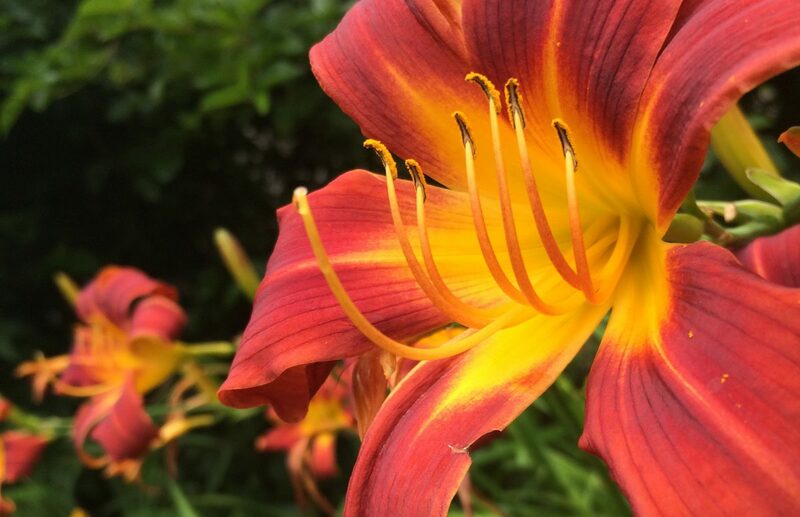 Diane enjoys gardening (and daylilies in particular) about as much as I do – even hooking me up with five new daylilies for my garden (pictures to come next summer)! Mom’s blood pressure was very high, and had been trending that way for some time. This hypertension is likely one of the reasons she has been having increased difficulties with headaches. Diane suggested that a trial of blood pressure medication might also help her with a number of other uncomfortable problems. She suggested a medication known to have a sedative effect on some patients, which may ease Mom’s anxiety and help her get more restful sleep. For the sake of Momma’s (and my) sleep and for comfort related to hypertensive headaches, I decided to try the medication. I’m not entirely convinced it is helping with sleep, but I am thankful her blood pressure is now normal and headaches are no longer an almost daily complaint. Diane has been helpful in so many other ways, including being a liaison between me and mom’s primary care physician, following through on medication changes and checking for understanding regarding those changes. She has helped me work through decisions related to whether or not additional dental work should be done (weighing the trauma it may cause versus the benefit it would bring), connected me with caregiver resources and information to feed my inquiring mind. As a caregiver, I see palliative care as being the comfort care “bridge” between Momma’s failing physical and mental health and the hospice care that will be provided for end of life needs. I am ever so grateful for Diane as she helps me walk my sweet mother Home on this leg of life’s journey with Alzheimer’s.